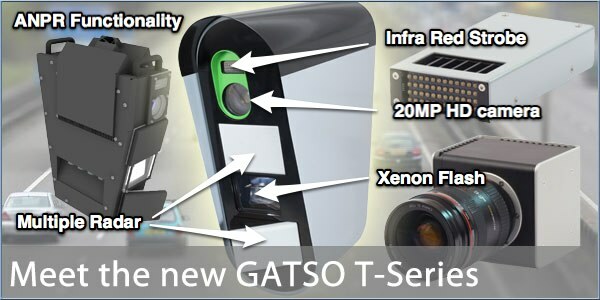 GATSO have taken the wraps off the latest in their long line of speed cameras. The T-series is an all digital platform that encompasses a High Definition camera, multiple lane and multiple vehicle radar coverage, and an infra-red strobe and xenon flash unit. As well as the traditional speed enforcement role, the new platform can support many other roles aand adds support for ANPR functionality such as identifying vehicles on black lists, suspect vehicles etc. The dual antenna RT3 tracking radar can monitor up to twelve vehicles across multiple lanes simultaneously and as well as speed enforcement it can be used to monitor or enforce red lights, stop signs, rail crossings and illegal lane changes. Big Brother is watching and you can be certain that we'll be seeing these on our streets once testing has completed and the necessary Home Office Type Approval has been secured. Yippee! What next? A cure for cancer? A decent old age pension? What next? A cure for cancer? A decent old age pension? All very fancy but they need a valid address to send the paperwork to. If the ANPR picks out a rogue vehicle I'll bet there is no traffic unit close by to take over.